Agio, Italian for the word “leisure,” has given homeowners around the world the freedom to discover, design and live well in their outdoor rooms. 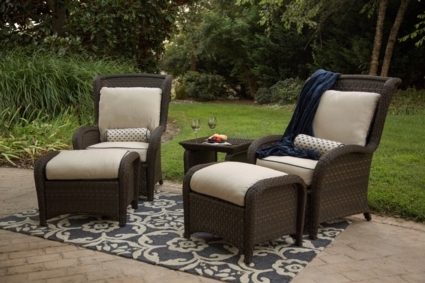 With looks that range from casually comfortable to elegant and dramatic, no matter which Agio collection you choose, you choose the brand that combines the finest materials and craftsmanship to create an outdoor room that you and your guests will enjoy for years to come. Discover your entertaining self with a look that says “you” and a look that says Agio with the Jefferson Collection. This collection includes two lounge chairs with throw pillows & ottomans as well as a side table to share.